I tend to get drawn back to the Cononish Glen and to Ben Lui on a fairly regular basis. The two hour long walk to the base of Ben Lui from Tyndrum is a real pleasure in its own right even if you don’t go on to climb the hill. 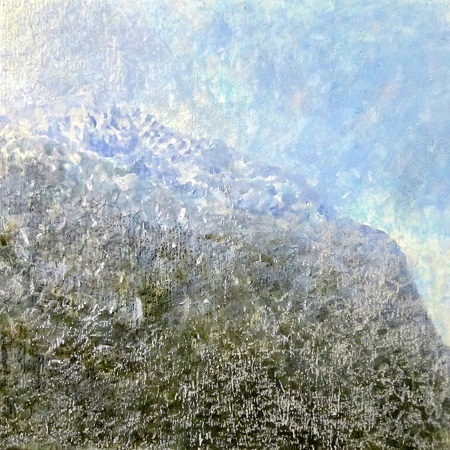 This new little painting is based on a day a few years ago when we’d planned to walk Ben Lui by its south ridge. We’d gone with a couple of friends but the conditions where far from good and they weren’t really kitted out for what higher up turned out to be very cold, wet and snowy conditions. We’d reached the bealach between Ben Oss and Ben Lui but had met the snow at that point and it really didn’t take much thinking about to decide that the prudent course of action was to head back down. As we once again reached the end of the main track in Cononish Glen and stood right below the main bulk of Ben Lui, a heavy snow shower swept in. I remember standing there watching the big white snow flakes fall against the dark background of the hill. It wasn’t a hugely successful walk but that short moment has stuck in my mind and helped make the cold wet day a memorable one. >> Next Post: 12 Open Doors ….